One way that I DO believe God still speaks to His people is through dreams but even then I would say that such dreams needed to be examined, tested and tried before they are just declared to be "from God." That said, there have been a few occasions where I've had dreams that I've submitted to the spiritual authorities in my life for examination. These dreams have been inspiring and encouraging. I wouldn't add them to the canons of scripture or anything like that. Rather, they've merely been a gift of encouragement to me during some significant rough spots in my life journey, reminding me of scriptural truths. The following was one such dream which I offer up as encouragement to you because I think it can be that, as a good story could be. Not a scriptural truth but representing one all the same. I wanted to go on an adventure so an Adventure Guide was assigned to me. He had a khaki outfit on it, complete with vest, etc. He told me we were going to go on an adventure on the ocean. I agreed to go. He helped me aboard a raft. The raft was completely flat and was made out of a solid piece of material. It wasn't made of wood like you'd normally think of - but was more of a metal looking thing -- completely flat with a slick surface. My Adventure Guide (that was his official title in my dream) talked to me while the raft was led out to sea. I noticed that the raft was attached to a boat. The boat was pulling the raft. I didn't take note of who was in the boat or anything of it. I was focused on the raft. 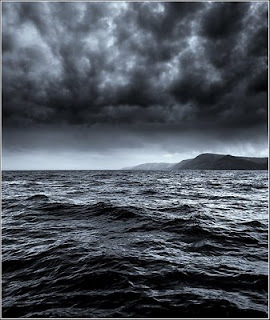 We traveled out to sea whereupon the sky grew very dark and a storm overtook us. The waves got higher and the wind blew harder. It was a picture like you'd see on a movie where the storm comes in the night and the only light is provided by a reflection of the moon on the water. I asked the Guide if we were going to go back to port. I told him I wanted the adventure to be over. He said we had to ride out the storm. In the meantime, the raft did a complete flip over, like a capsizing. I came back out standing on top of the raft, holding the Adventure Guide's hand but I was sopping wet and scared of the storm. I yelled at my Adventure Guide that the storm was getting too rough and couldn't the boat steer us a bit straighter so that we wouldn't capsize??!!?? Then the Adventure Guide pointed at the boat. I noticed that there was one person driving the boat and he was in an enclosed cabin. I could only see the back of this person's head. I never saw his face. The driver was wearing a Captain's Hat. I took note of all of this and then the Adventure Guide pointed to the Captain and said, "He's purposefully steering the boat like this." (We were zig zagging.) I asked "WHY?! We're going to flip over again if He isn't careful!" He calmly said, "It's not the storm that is causing us to flip -- it's the Captain himself. Look..." I looked inside the cabin, through the pouring rain, and saw that the Captain had a little knobbed handle that he could move from right to left. A flick of the handle would cause the raft to flip. "Watch," he said. I watched as the Captain reached over (again, all I could see was the back of the Captain with his Captain's hat on.) and flipped the switch. We flipped again and I crashed through the water and waves, clutching onto my Adventure Guide's hand and again, I came back up with my feet planted firmly on the raft. I was gasping for air. Then the Adventure Guide told me that the Adventure was in learning to stand my ground without holding on to his hand, even though the raft was going to flip. (He would still be on board the raft, but the fear would not be.) The next thing I knew, the Captain Himself was standing in my peripheral vision. He was holding onto my right hand while the Adventure Guide was holding on to my left hand. The Captain caused the raft to flip again. I clutched on to both of their hands, terrified. We came back up. The AG told me that I could stand my ground alone, with practice. (The Guide would still be on the raft with me, but I wouldn't need to be held up to make it through a flip.) The raft flipped again. This time I held on to their hands for half the flip and let go at the end of the flip and tried to steady myself. The AG encouraged me while the Captain stood silently by. We flipped twice more before I could do it without holding their hands so tightly. Occasionally I'll come across a story, see a picture or hear a song that reminds me of this dream and gives me renewed strength and encouragement to not fear life so much, but to hold steady. I haven't completely let go of the fear and every so often I take a tumble again. But I do find it easier, when trials come, to say, "Oh! God is in this!" I start looking for Him faster, eager to find Him. Recently I heard this song and it reminded me of my dream which sparked the memory and I thought I would share it. I think that God can show us things in dreams. I haven't experienced any like that myself, but my dreams reveal things about myself that I might not have otherwise realized (like what I'm thinking about and what I'm afraid of). Wow, what an amazing encouragement in your dream and the raft flipping. I also like the theology in which you explained the dream. I've noticed too how important some dreams are in the Bible. The prophetic visions. Joseph's dream about fleeing to Egypt. Where would we be without these? Very cool to read about your dream. I've had a few too, one in particular, that reveals my situation quite starkly to me, and that comes to mind at certain moments. Wow! I agree with your comments about dreams. They aren't doctrine and if they are from God they won't be contrary to scripture. But I believe God still uses dreams to speak to us about his will or to encourage us. Thanks for sharing your dream. I can see how it would be encouraging to you. Thank you SO MUCH for sharing this, as lately I've been asking around to see if anyone else still believes God can speak to them about their future and stuff. I believe God gave me some words, and yes, I've looked to Scripture to be sure it's not just hooey I'm believing. And, more and more I'm becoming convinced that God has truly 'spoken' to me. I wrote a post about it at my own blog, if you care to read it and comment.